“Buy and Transform” Model. PE firms nowadays don’t simply buy to sell, or buy and hold their portfolio companies. Rather, they buy and transform. Historically, PE firms added value to portfolio companies through its data-gathering and number-crunching capabilities. However, value creation today requires more; over 50% of a firm’s value can be attributed to intangibles. Unexpected CEO Turnover Is Common and Can Be Disastrous. 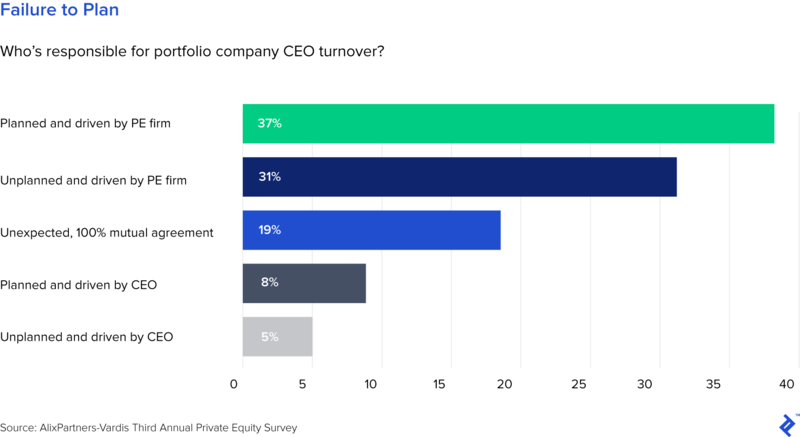 Over half of CEO turnover at portfolio companies is unplanned. The survey revealed that 73% of CEOs are likely to be replaced during the investment cycle, with 58% of replacements occurring within two years. CEO turnover is costly for investors: Unexpected CEO turnover can cause a less favorable internal rate of return 46% of the time and a longer hold time in 82% of instances. Don’t Hire Management Based Solely on Credibility or Experience. Experience can be overrated. This can quickly rule out many talented contenders or yield candidates inclined to recycle strategic plays that aren’t tailored to the new company. PE firms should be open to hiring “nontraditional” candidates without Ivy League degrees and who’ve taken more unusual paths in their careers. Soft skills including authenticity, teamwork, a bias to action, and resilience are also key. Don’t Fail to Keep a Stable of Great CEO Contenders. While it’s always important to align incentives for and support the management team, PE firms should also be prepared for the possibility of having to replace them with someone new. Experienced PE firms anticipate the potential need to take decisive action by keeping a pool of experienced executives on call and who can be trusted to fulfill management duties. Do Go Beyond the C-Suite. Companies without multilevel succession roadmaps are inevitably less agile than those who do when it comes to changes in technology and industry. If selling a business relies on only one or two leaders, buyers become wary of the financial future of the company and likely won’t pay as much for it. Do Rigorously Assess Soft Skills While Recruiting. Often, the skills most difficult to assess seem to be the crucial ones. Of the portfolio company executives surveyed, 67% say that leadership skills allow them to perform at the highest level, while 46% place a similar importance on strategic thinking. Clearly, it’s important for PE firms to take alternative approaches to CEO assessment, including independent third-party assessment. These types of assessments often combine interviews with behavioral and psychometric testing. Do Consider Hiring a Leadership Capital Partner (LCP). Today over half of PE firms now employ leadership capital partner (LCP), who help PE firms conduct data-driven evaluations of a potential target’s leadership and culture. Once a company has been acquired, the LCP facilitates the transformation. LCPs also often take part in divestiture negotiations, highlighting leadership and culture to help attain favorable pricing. Do Set Expectations to Proactively Avoid Potential Misalignments. Being a leader at a portfolio company presents a set of challenges unique to the PE industry. For private equity firms, understanding common points of disagreement can help both parties improve productivity and potentially avoid an unplanned leadership exit. 78% of PE respondents indicated that change of pace was one such source of conflict, with performance targets being the second most contentious issue (50% of respondents). There are also gaps in expectation around frequency of contact. Only 3% of PE respondents said they were satisfied with monthly meetings while 31% of CEOs preferred these. And, 33% of PE investors expected availability around the clock while only 14% of CEOs agreed. Private equity firms themselves are not immune to the importance of succession planning. Clients and limited partners, whose funds are typically locked up in a fund for 10 years or more, are concerned about who will be managing their money at that point. Only 12% of PE funds come to a close under 10 years, and the average duration of a PE fund is 13 years. The Thelander-Pitchbook 2015 Investment Firm Survey found that 47% of the 446 US investment firms surveyed, including 160 PE firms, did not have a succession plan in place. However, in April 2016, Bain Capital promoted four executives; two to co-managing partners and the other two as co-chairmen. In July 2017, KKR & Co. named two executives in their 40s to co-presidents and co-chief operating officers underneath 73-year-old founders. A 2016 survey of over 2,500 global investors revealed that team composition and organizational stability were the overwhelming metrics relied upon for predicting future performance. Maintain Incentive for the Next Generation of Leaders. As a Preqin report notes, it’s key to ensure that the economic structuring and incentives are allocated according to party involvement. As senior partners’ involvement diminishes, they must also be willing to decrease their economic interest in the funds and partnership. One way of doing so is reassigning the carry or setting up new management companies for the funds, which will allow for senior partners to wind down ownership. While growing investor enthusiasm has contributed to a flood of capital (a historic $3 trillion over the last five years), the private equity industry faces increasing competition amongst PE firms, record-high multiples, and other factors making it difficult for them to generate attractive returns. One aspect for consideration is succession planning, especially since CEO turnover at portfolio companies occurs at a rate of 73% and has been shown to increase hold time and decrease returns. While succession planning is undoubtedly important for the continuity and sustainability of any company, it may be even more true for those in the private equity industry. This article defines succession planning and examines the best practices and mistakes to avoid in succession planning for PE portfolio companies (beyond just the CEO level). It also explores succession planning within private equity firms themselves, something PE firms have been uncharacteristically proactive about confronting recently. What Is Succession Planning for Private Equity Portfolio Companies? Private equity has long relied on a fundamental premise: PE firms buy businesses for their portfolios, facilitate rapid performance improvement, and sell them. Ideally, the acquired firm will increase its valuation from its original purchase price, and thus create a profitable exit for the PE firm—typically within four to seven years. However, as a recent Harvard Business Review report declares, PE firms nowadays don’t simply buy to sell, or buy and hold their portfolio companies. Rather, they buy and transform. With a “buy and transform” model, “financial discipline is not an event, but a pattern; strategic clarity is not a direction, but a commitment; operational excellence is not a tool, but a mindset.” In light of this evolution, the approach to talent must also adapt. Historically, PE firms added value to portfolio companies through their data-gathering and number-crunching capabilities. However, value creation today requires more; over 50% of a firm’s value can be attributed to intangibles like brand and leadership capital. Private equity succession planning is especially critical for portfolio companies since their leaders face challenges unique to the private equity industry. From the perspective of the PE firm, the issue at hand is not whether existing leadership is “good enough”; rather, the challenge is identifying management fit for the purpose. Because strategy constantly changes under PE ownership, capabilities necessary for success do as well. So, PE firms should find flexibility in leadership and not veer too far from the value creation plan. And, leadership must truly accept and understand the demands of working with PE partners: more pressure, an accelerated timeline, and less tolerance for “sacred cows” or legacy business practices that no longer make sense. According to an AlixPartners 2017 survey of 53 PE firms and 63 portfolio companies, over half of CEO turnover at portfolio companies is unplanned, resulting in longer hold times and lower returns. The survey revealed that 73% of CEOs are likely to be replaced during the investment cycle, with 58% of replacements occurring within two years. 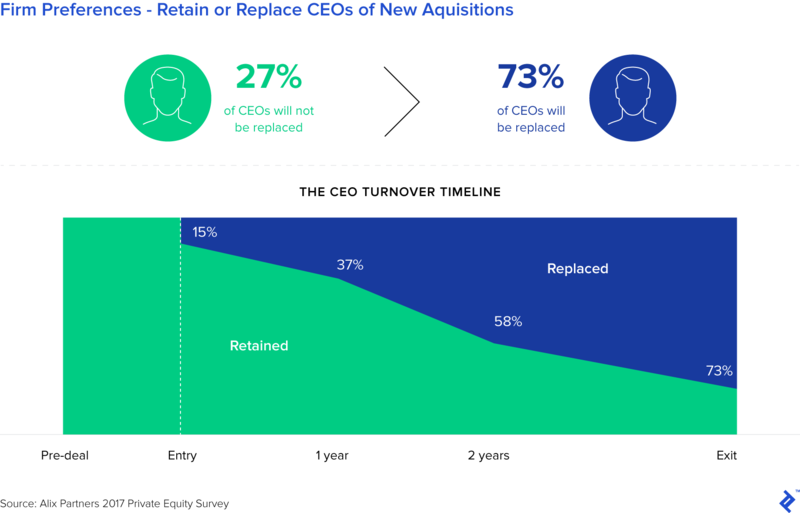 Perhaps unsurprisingly, CEO turnover is costly for investors: unexpected CEO turnover can cause a less favorable internal rate of return 46% of the time and a longer hold time in 82% of instances. Therefore, succession planning should be at the top of the list for PE firms. Prioritizing it helps establish buyer confidence and limits the potential negative influence that unplanned leadership changes can have on productivity, morale, and returns. The following sections will detail a number of best practices and mistakes to avoid in private equity succession planning for portfolio companies. Experience can be overrated. Certainly there’s comfort in hiring someone with pristine credentials, but this can quickly rule out many talented contenders or yield candidates inclined to recycle strategic plays that aren’t tailored appropriately for the new company. According to a study conducted by executive search ﬁrm DHR International, “Past accomplishment and current challenge is rarely an apples-to-apples comparison.” PE firms should be open to hiring “nontraditional” candidates without Ivy League degrees and who’ve taken more unusual paths in their careers. Soft skills including authenticity, teamwork, a bias to action, and resilience are also key. In fact, the best managers value employee development despite aiming to exit within seven years’ time. CEOs at the best PE-owned portfolio companies value both recruiting and talent development. In fact, they focus on employees whose development will have the greatest impact over this period. While it’s always important to align incentives for and support the management team, PE firms should also be prepared for the possibility of having to replace them with someone new. Delays in replacing a CEO can thwart the success and eventual company valuation. Thus, experienced PE firms anticipate the potential need to take decisive action by keeping a pool of experienced executives on call and who can be trusted to fulfill management duties. They undertake an honest evaluation of the CEO and their lieutenants against the important components of the value-creation plan and then make necessary changes quickly after the acquisition. Most companies only focus on succession planning for the executive team when it should concern all levels. Problems will emerge if someone in top management leaves and the tiers below are not capable of stepping up. Having an internal resource already familiar with the firm is far more valuable than recruiting externally and ramping them up. Companies without multilevel succession roadmaps are inevitably less agile than those who do when it comes to changes in technology and industry. If selling a business relies on only one or two leaders, buyers become wary of the financial future of the company and likely won’t pay as much for it. When it comes to recruiting leadership, certain characteristics are simpler to assess. One such example is financial acumen. In the AlixPartners 2017 survey, 90% of PE respondents were confident in their ability to gauge financial acumen, with a similar percentage confident in their ability to assess sales and marketing skills. On the other hand, 35% and 28% find it difficult to evaluate leadership skills and strategic thinking, respectively. Unfortunately, the skills most difficult to assess seem to be the crucial ones. Of the portfolio company executives surveyed, 67% say that leadership skills allow them to perform at the highest level, while 46% place a similar importance on strategic thinking. Clearly, it’s important for PE firms to take alternative approaches to CEO assessment, including independent third-party assessment. These types of assessments often combine interviews with behavioral and psychometric testing. Some even include evaluations of target company’s reputation or insights from former executives, customers, or suppliers. Today over half of PE firms now employ a leadership capital partner (LCP), who influence decisions around which firms to acquire. While analyzing leadership capital has long been a component of due diligence, LCPs are now helping PE firms conduct data-driven evaluations of a potential target’s leadership and culture—whether they are performing the analyses themselves or managing external consultants in the task. Once a company has been acquired, the LCP facilitates the transformation. This requires fundamental changes in organizational culture, process, and talent, as opposed to cost-cutting measures and financial restructuring. For example, LCPs audit the leadership and culture annually, identifying priority actions for management teams. And, since the private equity industry has been moving towards a more “real estate developer” approach, the LCPs share best practices across the firm, encourage organizational innovation, and provide insights to tasks like hiring Chief HR Officers (CHROs). LCPs also often take part in divestiture conversations, highlighting leadership and culture to help attain favorable pricing. LCPs often use the results from their research to instill confidence with buyers that positive financial results will continue post-purchase. 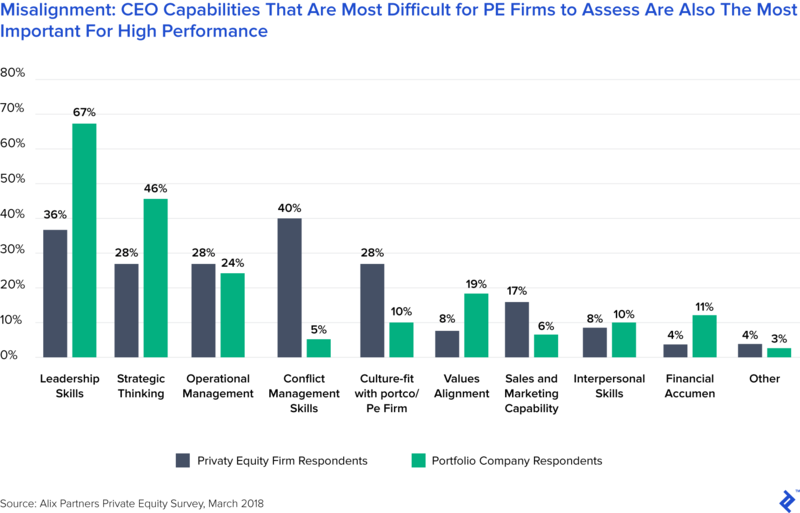 Being a leader at a portfolio company presents a set of challenges unique to the PE industry: They answer to the firm and its investors, they’re expected to achieve transformational efficiencies within a short time-frame (the median holding period in 2017 was five years). While the average CEO tenure at S&P 500 firms is 10 years, this is certainly not the case for portfolio company leadership. Therefore, for private equity firms, understanding common points of disagreements can help both parties improve productivity and potentially avoid an unplanned leadership exit. 78% of PE respondents indicated that change of pace was one such source of conflict, with performance targets being the second most contentious issue (50% of respondents struggled with this). There are also gaps in expectation around frequency of contact. 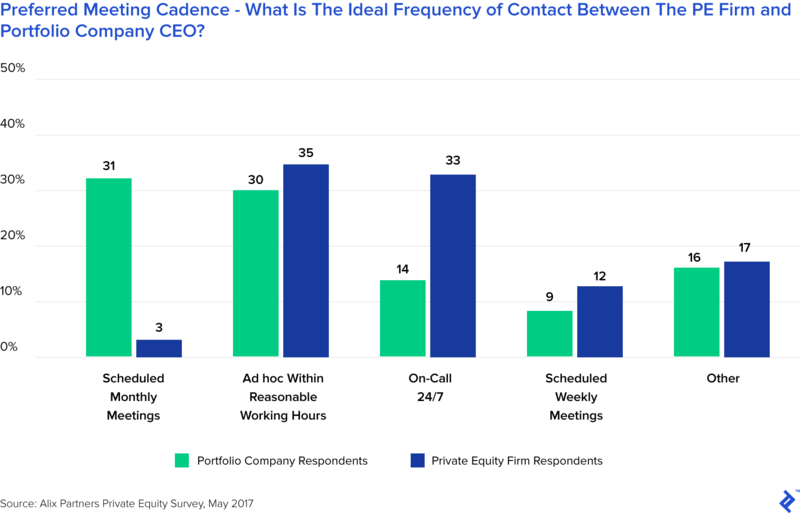 When asked about the availability of portfolio company CEOs, only 3% of PE respondents said they were satisfied with monthly meetings while 31% of CEOs preferred these. And, 33% of PE investors expected availability around the clock while only 14% of CEOs agreed. Such stark differences indicate that it’s crucial to establish clarity and alignment around these expectations early in the investment cycle. Private equity firms themselves are not immune to the importance of succession planning. Clients and limited partners, including pension plans and other institutions, whose funds are typically locked up in a fund for 10 years or more, are understandably concerned about who will be managing their money at that point. Only 12% of PE funds come to a close in under 10 years; according to research from Palico, the average duration of a PE fund is 13 years. Successive funds are often raised one-by-one, often closed by the same legacy dealmakers. Many founders of the largest PE firms like Blackstone, Carlyle, and KKR are now entering their 70s and 80s, so these issues are coming to light. It’s also important to note that young talent at these PE firms become frustrated when upward mobility is unclear. For many years, private equity succession planning has been minimal. The Thelander-Pitchbook 2015 Investment Firm Survey found that 47% of the 446 US investment firms surveyed, including 160 PE firms, did not have a succession plan in place. However, this is becoming less of the case. In April 2016 Bain Capital promoted four executives; two to co-managing partners and the other two as co-chairmen. In July 2017, KKR & Co. named two executives in their 40s to co-presidents and co-chief operating officers underneath 73-year-old founders. A 2016 survey of over 2,500 global investors overseeing over $300 billion in assets under management, revealed that team composition and organizational stability were the overwhelming metrics relied upon for predicting future performance. Valuations Should Serve as the Foundation for Private Equity Succession Planning. A thorough, effective succession plan requires accurate valuations to help determine how future income will be allocated. Due to its importance and to potential subjectivity, many firms opt to hire objective third-party valuation specialists. Since investment management firm valuations typically separate income from management fees from income from performance fees, it’s important to handle both differently. While management fees are more predictable, especially for established firms, they can be valued using a market approach by applying a market multiple to AUM or net operating profit. However, carry is far more subjective because of its contingency on the underlying portfolio companies, so valuations should consider a spectrum of possible outcomes. The future value of carried interest is usually heavily discounted to account for the risk associated with earning it. While private equity succession planning may seem uncomfortable initially, it serves as a salient form of insurance for both portfolio companies and private equity firms themselves. For PE firms, the mere process can create a sense of ownership across all levels and can help create alignment of incentives internally while showing others that the firm is sustainable.